Between novels being published, there’s often not a lot of news for a writer to share but this update is a big deal for me! I celebrated a milestone birthday (21, again!) last week and used it as a good excuse to go on a special holiday to Russia, a place I’ve wanted to visit for a long time. We started off in Moscow and did all the usual touristy stuff but then took the train to St Petersburg for a few days. This was more of a ‘work’ than ‘play’ trip as the novel I’m writing refers to the Siege of Leningrad and I wanted to do some research. To get a feel for the impact on the city, I went on a private walking tour of the main sights related to the siege and also to the museum dedicated to the events (essential to have a guide as the signs are only in Russian). After the tour, I met with a retired curator who is an expert in the albums referred to in my novel which contain messages of support and solidarity between the women in Leningrad and Airdrie and Coatbridge, my local area. Irina’s specialist input and generosity in sharing her extensive knowledge was invaluable preparation for the following day. This final appointment took a lot of planning to make it happen but it was well worth the effort. The highlight of my visit to St Petersburg was when I had the absolute privilege of a private viewing of the album which was sent from Scotland and is now in possession of the state history museum. To be allowed this opportunity was an honour and an emotional experience. I’m now home and even more fired up to attempt to bring this amazing story to life. Better stop eating birthday cake and get back to my desk and writing then! Have you made a special trip for research? Or celebrated a big birthday somewhere that was on your ‘bucket list’? 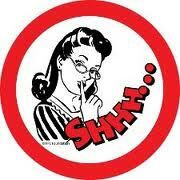 Libraries: where shhh happens! And I know better than most as I worked in a library during my years as a student. I’ve been told that I have a touch of OCD, so the Dewey Decimal System appealed to my anally retentive sense of order. And with my love of books and hobby of people watching, it was the ideal job for me (I’ve even got the ideal specs!). I’ve professed my love of libraries in a previous blog post to celebrate National Libraries Day and because I’m very nosey, I was keen to go on a Behind the Scenes at the Mitchell Library tour with my good friend Katy. I’ve often visited the library for events such as the Aye Write Book Festival but I’d never spent much time actually looking at the building or having any real appreciation of its history. 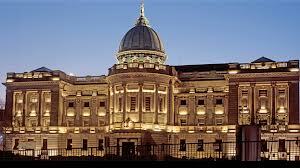 The Mitchell Library is one of Europe’s largest public libraries with over one million items of stock and is the hub of a city-wide information service. With its distinctive green copper dome, the building has been one of the city’s iconic landmarks since it opened in 1911 and our tour guide, Myra Paterson did a great job of bringing its story to life. It was fascinating to learn more about the library and its special collections including over 5000 items relating to Robert Burns and the Jeffrey Reference Library of rare first editions. I’ll stick with my favourite Chanel Allure perfume. I wish technology made it possible for this blog post to somehow have a ‘scratch and sniff’ function for me to share the library’s most memorable impression on me. Behind closed doors, the library reeks! Ancient books have a unique smell and whilst I did notice some of my fellow tour guests inhale deeply and let out a satisfied sigh, ‘Eau de Bibliothèque’ is not a fragrance I’d like to douse myself in. Our group also got the chance to tour the basement of the library where old newspapers and magazines are stored. The stinky minky smell that greeted us was one of dampness and decaying paper so the feeling of being in the bowels of the building was very apt. The basement has retained The Herald from its first edition but unsurprisingly, The Sun has not been kept for future generations! There’s a massive amount of reference material stored but in the digital age, I wonder how long paper copies should continue to be archived and take up an enormous area of space. Stunning artwork and poignant messages. One of the advertised highlights of the tour was access to the Leningrad Album. I’d never heard of the album so not wanting to look like a complete ignoramus, I managed to lose hours on the internet when I was sucked into an amazing story of solidarity in the face of extreme hardship and suffering. 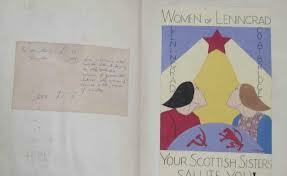 In 1942, the women of Airdrie and Coatbridge sent an album containing over 6000 messages of support to their beleaguered counterparts in Leningrad who were besieged by fascist forces. Leningrad writers and artists responded by posting an album back to the people of Airdrie and Coatbridge but this was delivered to Glasgow in error in 1943 and is now kept in the Mitchell. 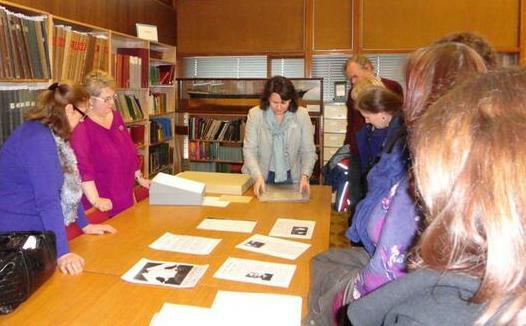 Me (bottom right-hand corner) with the group learning more about the Leningrad Album. Whilst it was great to see this historic artifact, an important social document, I did feel that it shouldn’t be kept in a Glaswegian library. It belongs to the people of Monklands so surely there’s an ethical obligation on Glasgow City Council to return the album to its rightful owners? I hope one day it makes its way east to its true home. For a book lover and library geek like me, it was great way to spend a Wednesday afternoon. I’ll definitely look at the Mitchell with fresh eyes and a better appreciation of the secrets it stores on my next visit and I’d recommend touring a jewel in the crown of Scottish libraries. But just remember to bring a clothes peg for your nose! Do you share my love of libraries? Have you also visited any landmark libraries?